Congrats to Schallenballa for the winning entry and 50 duck prize. Thanks to everyone who entered and voted! Here are the final results of the Caption the Drawing caption contest. "When people shove Christmas down my throat"
When Christmas music plays in October. "I told you not to sneak into santa's party"
The day after halloween, christmas appears. The holiday season clearly isn't for everyone. "All the cool holidays are doing it." And you thought pumpkin spice was bad. Pumpkin learned the true meaning of halloween. Why isn't this a pokemon? Easy on the eggnog, pumpkin. Pumpkin gets sick of Christmas, "literally"
He still hasn't recovered from Halloween, yet. Ech! Is this what Christmas candy tastes like? Halloween is sick of Christmas. Christmas seems to come earlier every year. Always happens when you aren't prepared, Jack. Go away pumpkin you are in the wrong holiday. This is the last time I work overtime! Is it too soon? Yeah, too soon. Halloween had too much christmas. Symptoms include vomiting and being a pumpkin. COME ON, JERRY! POISONED MY CANDY CANES AGAIN! Had one too many candy canes. "We gotta-BLGRH go back to our universe Morty"
Halloween and Christmas do not mix well. Jack-o-Lantern is disgusted by christmas. Silly pumpkin, don't eat candy canes whole! Pumpkin celebrates Christmas, it backfires. Christmas and Halloween just don't mix. Halloween is sick of hearing about Christmas! Twas the ni- oh, god, what did I eat?! I'm on that side of Drawception again.. Yay! It's too early for christmas! "I must have eaten too many candy canes..."
the xmas spirit is TOO MUCH FOR A PUMPKIN! Think you ate too much candy before Christmas. Go home pumpkin you're drunk! First time trying eggnog, BIG regret. The festivities were too much for pumpkin. Jack O Lantern is so sick of christmas..
Halloween copies Christmas; Gets carried away. Ol' Jack had too much candy cane rum. A victim to Christmas starting a month early. Halloween, stop drinking and go home. Move over Halloween, it's Christmas! Halloween is sick of all the Christmas. Jacko'Lantern Skellington learned a lesson. Go celebrate your own holliday! Christmas pumpkin puking up candy canes. We are so sick of the holidays! Santa pumpkin who mixed meth with candy. Silly pumpkin, Christmas is for figgy pudding! Snot Christmas again already, is it? A Jack-O-Lantern experiencing Christmas cheer! Festive pumpkin vomits candy canes. MOM I'M FINE, more candy! NOW!! The pumpkin's sick of Christmas commercialism. When you know you had TOO much candy canes. 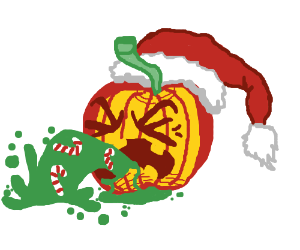 Jack-O-Lantern pukes after a christmas party. Pumpkin Spice had too much eggnog. *BLAARG* OH GOD I SHOULDN'T HAVE SWALLOWED!! Oh boy! A Christmas pinata? Must be FUN! Jack-O-Santa had too many candy canes! "AHH! Who gave me the FLUx-mas?!" The Halloween Candy Caught Up With This Guy. Pumpkin juice hates Christmas Season. Trial run for Xmas pumpkins isn't going well. I'M SICK OF CHRISTMAS AND IT'S PESKY ANTICS!!! Halloween candy, Now candy canes. Too much. Mixing Halloween and Christmas makes us sick! 'Scuse me while I puke these canes! Pumpkin doesn't like the holidays. Jackolantern prepared for Christmas too much. Oh no! the pumpkin ate bloody candy canes! NO! Not the holyday season again! Enjoying this Merry Halloween Chris.hit.mas! "I told you to throw this away, not 'fix' it!" Festive pumpkin throwing up christmas. Santa pumpkin is sick of Christmas candy. Jack O' Lantern is sick of Christmas. I HATE CANDY CANESSS!!!! -Sincerely pumpkin. a lollipop a day keeps yellmo away! Pukeing Pumpkin, you know? Christmas!? Santa Pumpkin vomits poison candy canes. Pumpkin hates Xmas but he has Xmas inside him! Pumpkin Gives In To Christmas And Candy Canes. A festive Jack-O-Lantern vomits candy canes. A Santa Clause pumpin puking up candy canes. The pumpkin had barfed out candy canes!